Model 270C\CE French Bread, Bun Slicer and Bagel Slicer -- Dutchess Bakers Machinery Co. Inc. 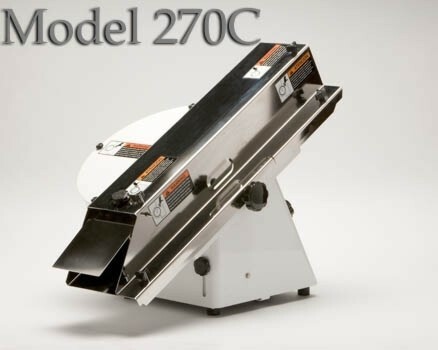 The M-270C is a more compact, space saving version of the popular Model 270. It is shorter and narrower than the M-270 while still capable of cutting product up to 6" wide x 3" high. The entire M-270 line will also include a new Manual Blade Brake which allows the operator to quickly stop the blade in the event of a product jam. This brake makes the machine much safer and user-friendly for owners and operators.